I am gearing up for Screen Free Week. I am excited and nervous. Excited to get the damn screens out of the living room, nervous about not blogging and checking facebook. I know my children will have no problem with it. We have been TV/screen less off and on for many years. And with the beautiful weather they’ll be playing outside a lot! We’re secretly buying a few new toys to restock our supplies – Tinker Toys, Lincoln Logs, and art supplies, in case we get a rainy day. It will help that we have a busy week planned too. A field trip to the museum’s Titanic display, Waldorf homeschool silk dying day, book club, 20,000 bees and the American Atheist National Conference. I have been listening to the lectures on Feed.Play.Love. A Virtual Conference. Some of the first ones were, well, uninspirational. But this week two really stood out: Media Impact and Child Development, a Realistic View with Kim John Payne and Dr. Thomas Cooper and Where Anything can be Anything: Fostering Creativity in Your Child with Sharifa Oppenheimer. They discuss how parents don’t want their children to be bored, but boredom is a gift. It is the gateway to creativity. And we often give in just before the creativity happens. As a parent of 7, I really enjoyed being reminded that sometimes the bridge between boredom and creativity is sibling torture. 🙂 I enjoyed the concept of Original Thought. How much original thought do we have? How much original thought does our child have? Are they only re-enacting what they see on TV? Singing commercial jingles? We put so much stress on IQ that we forget about “EQ” – emotional quotient. How to deal with other people in an honest way. The sheer amount of time spent in front of a screen does not engage active thinking or playing, creative pursuits, or talking in-depth with family and friends. Media exposure at a young age (birth through age 2) often substitutes for important parent/caregiver/child activities that encourage early brain development, such as playing, singing, and reading.The American Academy of Pediatrics strongly recommends reading to children every day, starting after they are first born. Reading stimulates the development of the brain, language and a closer emotional relationship with a child. Studies show a relationship between excessive TV viewing and declining school performance, particularly in reading and comprehension skills. 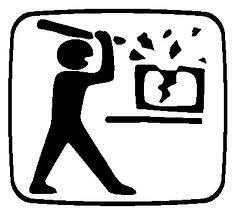 Viewers of media violence may engage in violent or aggressive behavior, become desensitized to violence, or experience the world as a scary, dangerous place. Media violence also can increase a young person’s appetite for violence in entertainment and in real life. Children and adolescents may learn and incorporate some of powerful myths and stereotypes about people from what they see on screen. Heavy media exposure may contribute to a “culture of disrespect” — intolerance, stereotyping, ridiculing, and bullying, which includes pushing, shoving, hitting, and kicking. Children and adolescents get all kinds of messages about tobacco, alcohol, and illicit drug use through media, mainly that such substance use is normative and/or associated with excitement and glamour. These images and messages may shape young people’s accepting attitudes and behaviors toward smoking, drinking, and illicit drug use. Studies have shown obesity in children — a very prevalent health problem — to be associated with heavy TV viewing. The most commonly advertised foods on TV during children’s programming are typically high in sugar, salt, and fat. Media advertising and commercialism entice people by using powerful visual images and audio effects. This can be compelling, especially for children under the age of 8, because, developmentally, they are unable to understand the true intent of commercials and advertising — which is to get them or their parents to buy a product. Children are also frequent targets of product merchandising for new movies, TV shows, and musical groups. This applies to “educational” screen time as well! Just this week the Center for a Commercial Free Childhood filed a Federal Trade Commission complaint against Your Baby Can Read!, a video series that encourages parents to put infants as young as three months in front of screens. The complaint is part of their ongoing campaign to support parents’ efforts to raise healthy babies by stopping the false and deceptive marketing of “educational” baby videos. ◆ All media messages are constructed — and are constructed for some purpose. ◆ Media messages shape our understanding of the world. ◆ Each person interprets media messages uniquely. ◆ Mass media are often driven by powerful economic and political forces. 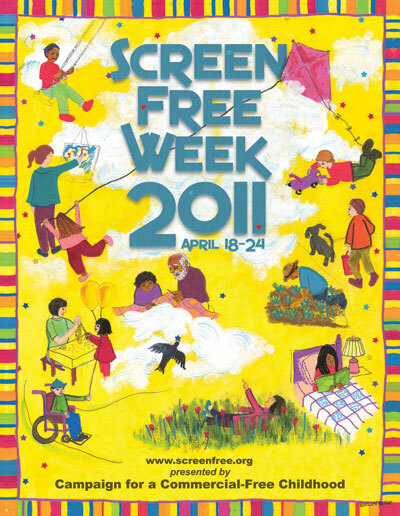 What do you have planned for Screen Free Week 2011? You can learn more at the Screen Free Week website, facebook page and RSVP at their event page. You can even register your family! I have decided I'll have to do SOME computer time each day, I have a craft show the 30th, and I want to post reminders, and pictures, etc during the week. But I'm setting a timer to do only those things.